The organisational structure of the Company was transformed in 2008 into a holding structure so as to strengthen the separation and transparency of the regulated activities in Spain -transmission and system operation- from the remaining activities. 100%Red Eléctrica de España, S.A.U. 100%Red Eléctrica de España Finance, B.V.
100%Red Eléctrica Infraestructuras de Telecomunicación, S.A.U. 100%Red Eléctrica Infraestructuras en Canarias, S.A.U. Red Eléctrica Infraestructuras de Telecomunicación, responsible for the management of the business in the telecommunications sector. Red Eléctrica de España carries out its regulated activities in Spain, which represent 93% of the Group's business and is owner of all the transmission and operation assets, and counts on the human resources and financial resources associated to these activities. In addition, it undertakes the Company's investment plan. Investment in electricity transmission infrastructure abroad is channelled through different subsidiaries integrated into Red Eléctrica Internacional (REI). In Peru, REDESUR and Red Eléctrica Andina (REA); subsidiaries wholly owned by REI. Similarly, REDESUR controls Transmisora Eléctrica del Sur, Transmisora Eléctrica del Sur 2, Transmisora Eléctrica del Sur 3 and Transmisora Eléctrica del Sur 4. In Chile, through Red Eléctrica Chile, a REI subsidiary 100%, it owns 50% of the share capital of Transmisora Eléctrica del Norte (TEN) as a result of the acquisition carried out in January 2016. The remaining 50% of TEN is owned by E-CL (belonging to the Engie group), a Chilean company behind the first interconnection between the northern and central electricity systems in the country. In 2017 Red Eléctrica Chile, through REDENOR (a company created in a 70%-30% consortium with Cobra Instalaciones y Servicios), was awarded the concession contract for the execution and subsequent management and operation of more than 258 kilometres of line in Chile. The project includes the design, financing, construction, operation and maintenance of the first 220 kilovolt (kV) circuit of the Nueva Pozo Almonte-Pozo Almonte line; the Nueva Pozo Almonte-Cóndores line, and the Nueva Pozo Almonte-Paranicota line, as well as the 220 kV Nueva Pozo Almonte substation - all part of the SING (Interconnected System of Norte Grande). In July 2018, Red Eléctrica Chile acquired 100% of the share capital of Centinela Transmisión for a total of 117.2 million dollars, including operating assets and projects under construction. In the Antofagasta region of northern Chile, Centinela Transmisión operated three 220-kilovolt (kV) lines that connect the Encuentro-El Tesoro, El Tesoro-Esperanza, and the El Cobre-Esperanza substations (a circuit of 265 km). The purchase also included the work to extend these facilities contained in the Transmission System Expansion Plan for 2016-2017. Red Eléctrica Chile, through REDENOR2, is the responsible for carrying out the project. Red Eléctrica Infraestructuras de Telecomunicación (Reintel)as of 1 July 2015 manages the telecommunications business, an activity that had been carried out by Red Eléctrica Internacional since 2008. Reintel is focused on the commercial management and use of the fibre optic infrastructure and its associated technical spaces, and has a fibre optic network of over 33,000 km deployed. Red Eléctrica Infraestructuras en Canarias (Reincan) responds to the need to promote energy storage projects in the Canary Islands, as tools for the system operator to guarantee the supply on the islands at all times and to optimise the integration of renewable energy. 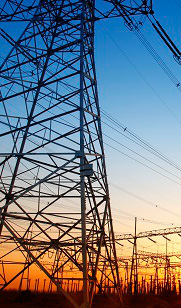 Red Eléctrica de España also owns a 50% stake in INELFE, a company created jointly with its French counterpart, RTE, for the development of interconnections with France.